Often, though, my first taste of this has been right out of the pot, by the warm spoonful and straight into my mouth, before it goes into anything else. Weeks hurried by. As I sketched and painted and dreamed up fancier things to blog about for the holidays, like the Gluten Free Sweet Potato Spice Cake with Apricot Carob Filling, this one pot meal was my mainstay. I’d find myself snapping a quick photo of it here and there in various stages of getting eaten up, thinking I would blog about it the next time. And the next. As it came to pass that the actual Thanksgiving Day was very close at hand, it occurred to me that this one-pot vegan wonder would make a fabulous stuffing for squash, with nothing more added to it than a few dried cranberries and some fresh flat leaf parsley, maybe some extra seasonings or a few nuts or seeds. And thus, the Fastest Whole Food (Gluten-Free) Vegan Thanksgiving Stuffing in the West was born. Put everything in a medium sized pot and bring to the boil. Lower the heat to simmer, cover, and cook for 30 minutes. Turn off the heat and leave it sit covered for another 10 minutes. To transform this lovely one pot meal into stuffing, toss it with a big fistful of dried cranberries and a bit fistful of chopped Italian parsley. Other add-ins that would pop the flavors out are grated garlic or garlic granules, a dash of lime juice, a a pinch of lime zest, marjoram, or any of the traditional “stuffing” herbs like thyme, rosemary and sage. A quick way to add that taste is with unsalted poultry seasoning powder. For a more Southwest flair, add chile peppers or substitute cilantro for the parsley. To be more decadent, add some diced avocado, or a few pistachios or pumpkin seeds or chopped walnuts. Up to you and your culinary imagination. 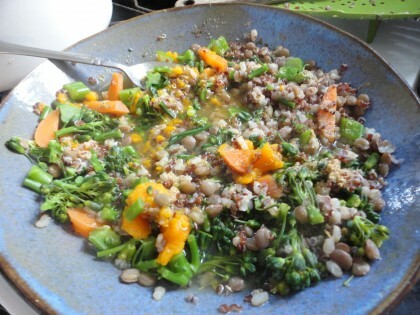 If by some miracle you are feeding a throng of whole food low-fat vegans, you can double the recipe. You can stuff this into any winter squash you can get cut into halves to bake. I used delicata squash, which are my favorites for something like this because they are easy to slice in half and gut and they taste great. The skin is so soft you can eat that too, if you like. To bake delicata or other smaller squash this way, I preheat the oven to 400 degrees. I sprinkle garlic granules on the cut and seeded squash halves. I place the halves cut side down on a cookie sheet lined with baking parchment. I bake them for about 45 minutes, until the outsides are soft to the touch. Once the squash are cool enough to flip over, fill them with the stuffing. If necessary or desired, reheat in the oven for a few minutes. Dig in. Or top with your favorite low fat vegan gravy. 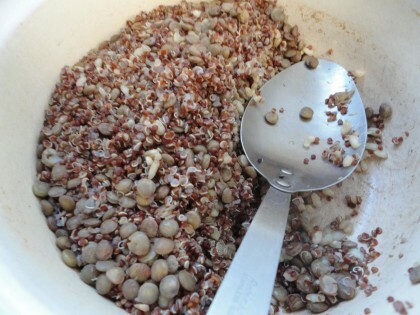 Notes: I get my red quinoa in bulk at the Moscow Food Co-op. I have never rinsed it, and it’s never bitter. But some quinoa does not come pre-washed. If you are uncertain, rinse it first. So now you’re armed and ready with the recipe for the Fastest Whole Food (Gluten-Free) Vegan Thanksgiving Stuffing in the West. If you’ll be facing down a SAD Thanksgiving table and don’t have a lot of time to cook, whip this up and pull it out of your whole food holster at proverbial “Aunt Milly’s” holiday get together. You won’t feel deprived, you’ll be eating great food, and I’m betting someone else will at least say, “hey, that looks pretty good.” It’s a sure-shot healthy meal in a dangerous boom town of fat and gluten and animal protein that can stand with the best of ’em. See you at high noon at the dinner table. Perfect! 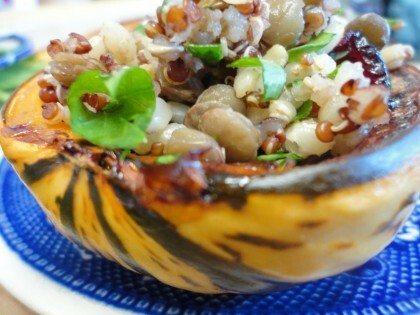 I have a delicata squash sitting in my pantry that’s just been waiting for a great recipe like this. I love your approach to food … a simple base … lots of fresh toppings … and, very importantly IMO … pleasantly paced with never a rush-crush-get-it-all-together at the end. Thanks for sharing this one. Thanks, Kathleen! So glad this is hitting the mark perfectly for you. 🙂 I appreciate knowing the pleasant pace of my cooking style is one of the most important ingredients for you. That makes me thankful all over again to have you as a reader. Happy Thanksgiving!! Happy Thanksgiving to you and to Romeo too, Maria. We will be just four: myself, my husband, and our two Romeo-equivalents: Orla, the lame little collie (lame being unfortunately an actual physical description, not an insult – she had a broken front leg which was not set, before we adopted her from an SPCA), and Rhys, the big Golden Retriever/Rottie mix. They are not service dogs, however, just pets. Rhys, at 90 lbs, is plenty large enough to be a service dog if we ever trained him to be, and I might someday. Orla is long and low, and only weighs 65 lbs. So as far as physical help goes, she couldn’t manage, especially since she only has three good legs. It’s a shame, she is extremely, extremely bright and learns very, very quickly. Anyway, my husband is doing our shopping now, and we expect to have a nice day Thursday. The same to you both! Romeo and their dog Lucy like to nap together 🙂 (Well, they both just plain love a good nap. Inspiring.) Have a wonderful holiday. Perfect timing! I’ve been searching for a stuffing recipe to use with some Swan White Acorn squash and all I had to do was open your message! I think your idea about adding the dried cranberries is a great one and maybe I’ll use 1/2 dried cranberries and 1/2 golden raisins. I’d like to add some nuts also, which do you think would be best: walnuts, pecans, or almonds?? You’re the best! Thanks Marcia–I love it when serendipity works thing out! I would choose walnuts or pecans over the almonds in this particular dish. Even pistachios might go. Or pine nuts. Just my personal taste though. 🙂 The swan white acorn squash sounds really neat. 🙂 Happy Thanksgiving!! 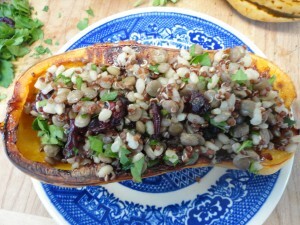 I made the Red Quinoa, Brown Rice, French Green Lentil Pilaf and stuffed 3 small Squash for a main entrée today. Because the price of Fennel was so high I used Celery Seed instead and Cumin. It was so good. I will for sure be making it again. Thanks for sharing. Hope your Thanksgiving was great .